Hello, lovelies, and welcome back to the Celebrity Lash and Brow Design blog! Now that we are in the throes of scorching summer temperatures here in Arizona, you are probably looking for all the best ways to cool off and beat the heat. One thing about having your eyebrows microbladed is that you can enjoy doing so many summer activities without the fear or worry about your penciled-on eyebrows coming off or smearing. Today, let’s explore some of the things you can enjoy doing this summer once you’ve had your eyebrows microbladed. 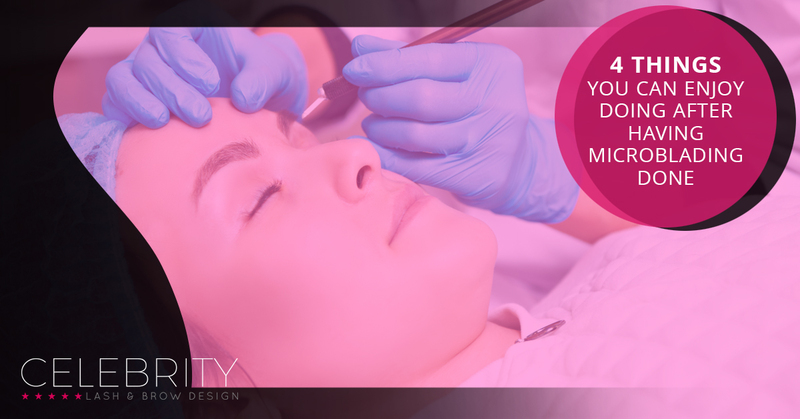 Are you looking for a beauty studio that offers expert permanent makeup and microblading applications? Contact us for precision microblading in Glendale, AZ! Our microblading artists are highly-trained, experienced, and use only the best semi-permanent pigments and microblading equipment. There is no shortage of swimming pools here in Glendale — thank goodness! there’s nothing like spending a Saturday or Sunday afternoon lounging by the pool, working on your tan, and swimming to beat the heat. Once you’ve had your eyebrows microbladed, you no longer have to worry about fully submerging your head underwater with the fear of losing your brows once your surface. You can swim and play all day and never smear or lose your eyebrows, as the semi-permanent pigment stays on no matter how many times you dive underwater. Spending a day at the lake is one of our favorite pastimes here in Arizona. Phoenix has several large lakes that offer watersports and recreation to cool off on those scorching summer days. Saguaro Lake is the perfect place to splash in the water on the beach or cruise the lake on a boat, jet ski, or kayak. Rather than spending time looking in the mirror to check that your eyebrows are still on, you can spend the entire day focusing on having fun, rather than the status of your brows. One of the best things about living in Arizona is all the waterparks. Waterparks like Sunsplash in Mesa offer attractions like a giant wave pool, water coasters, waterslides, and lazy rivers to cool off in. Plus, you can really let loose and let your inner child come out to play at these awesome local attractions. When you don’t have to spend the day worrying if your eyebrows have smeared or disappeared, you can more fully enjoy your time at these fun-in-the-sun waterparks. Visit one of the many luxurious resorts in and around Phoenix and Glendale and make sure to spend extra time poolside. There really is nothing like a staycation spent lounging by the pool in a beautiful resort while sipping icy drinks. What could make this even better? Not having to worry about reapplying your eyebrows for a night on the town after swimming and showering! If you’re ready to partake in these and other summertime activities without worrying about your penciled-in or powdered eyebrows coming off, schedule microblading in Glendale, AZ! As your Top Rated Local® beauty studio in Glendale, our microblading artists can apply semi-permanent pigment to your brow line for natural-looking, beautiful, full eyebrows that last for one to three years. Call Celebrity Lash and Brow Design today to book your microblading appointment now!